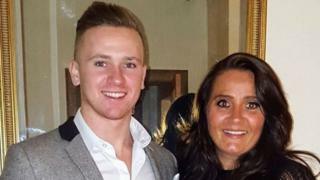 Image caption Corrie Mckeague's mother said all they have is "theories" but "no evidence"
A reward offered to find missing airman Corrie Mckeague has been doubled to £100,000. Mr Mckeague, who was 23 when he disappeared, vanished during a night out in Bury St Edmunds, Suffolk, in September 2016. On Monday, police said they had stopped searching a landfill site after finding no trace of Mr Mckeague. His mother Nicola Urquhart has begged people with information to come forward. She said all the family have is "theories" but "no evidence". "I plead to anybody involved that's spoken to us in the past, spoken to the police, to please get back in touch with us again," Mrs Urquhart added. The reward has been offered by local businessman Colin Davey. The search of the waste site at Milton, Cambridgeshire, restarted in October after a 20-week excavation ended earlier in the year. Suffolk Police said it was "content" Mr Mckeague was not in the landfill areas that had been searched and the investigation into his disappearance would continue. Mr Mckeague, from Dunfermline, Fife, was on a night out with colleagues from his base RAF Honington when he went missing. He was last seen at 03:25 BST on 24 September 2016 when he was captured on CCTV entering a bin loading bay known as the Horseshoe. His phone was tracked as taking the same route as a bin lorry, which led police to believe he had climbed in a bin and been taken to the landfill site. A £50,000 reward was first offered in December 2016. It was later withdrawn because it had not led to any new information, but was reinstated in August.